Try It Tuesdays! : Try It Tuesday: Do IGNITE Presentations! Try It Tuesday: Do IGNITE Presentations! Many of us have students do presentations to end a program or unit of learning. But often these can be kind of dull and teens may really resist making their presentations. One way to bring some more fun and excitement into the process is by having students make their presentations as IGNITE talks. 15 seconds of talking per slide--the slides advance automatically, so students must time their presentations to keep up with the moving slides. 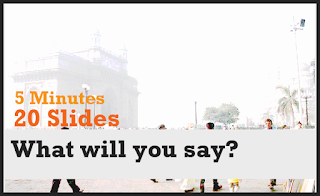 Each talk lasts only 5 minutes, so students must learn to be concise and succinct in their presentations. With the slides advancing automatically, this also makes it easier to hold kids to the time limit without feeling like you're interrupting or rushing them. Take a look at the presentation at the top of this post to get an idea of how an IGNITE talk works. And then go through the presentation below for some tips. Help students identify the main point of their presentation and key ideas they want to cover. This format requires them to be clear and succinct, so helping them to clarify their ideas first can make it a lot easier to create the presentation. One way they may want to think about it is do they want their presentation to inform, motivate or entertain? Encourage them to tell stories. Probably the most powerful way to structure an IGNITE is to have it revolve around a story that conveys a student's messages. Help them find stories that will make their points. 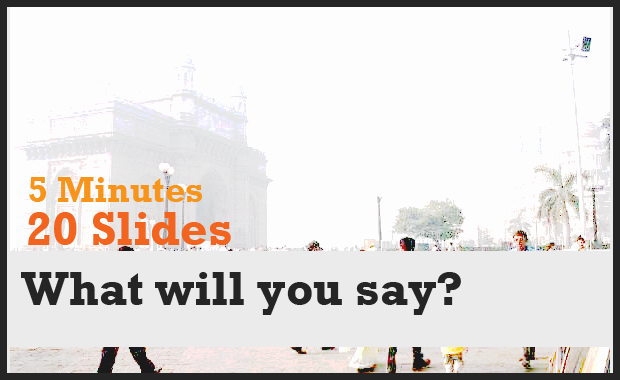 Slides should be visual--go for photos that capture a main idea, not a bunch of bullet points! A good rule of thumb is to have no more than 3-5 words on a slide. Use the Notes view in PowerPoint to write a script. This is one presentation format that requires you to know what you're going to say and how long it takes you to say it. By creating a script, students can be sure that they stick with the 15 seconds per slide requirement. Practice! And then practice some more! Getting the timing right is key in doing an IGNITE presentation. They also want to get comfortable with their scripts so they are looking at the audience and using comfortable body language, rather than staring down at their notes. Make sure students have time to practice their talks so that they know where they have to cut and where they may need to add more. Have fun! The IGNITE format is meant to be fun and entertaining, so encourage students to use this as an opportunity tap into their creativity. I run the Youth Leadership Academy in Delaware County for HS sophomores and we use IGNITE presentations as the culminating activity for our 3-day event. Because of the limited time, we have students work in teams of 3-4, having them create a presentation on what they have learned about leadership. You could do something similar, having students work in teams to address a particular question or topic from your program. I will point out, though, that IGNITE works best if teens are enthusiastic or passionate about their topic, so look for topics or questions that provoke or excite them. We do give students a lot of latitude to put their presentations together. I don't see them until they present, unless they have specific questions they want to ask. I'm invariably blown away by what they produce. After they present to our leadership group, they present to an audience of their parents and teachers. This is something else to consider--having students present to an external audience. This adds some extra excitement to the process. Finally, we record their presentations. Although we haven't done this, you could record and then upload to YouTube. An IGNITE makes a great addition to an online portfolio or to your website. The IGNITE format can be a powerful and fun culminating activity for students, one that challenges them to be creative and succinct. Let us know if you try this with your students. Better yet, record their presentations and share them with us. We'd love to feature them on the Try It Tuesday Blog!